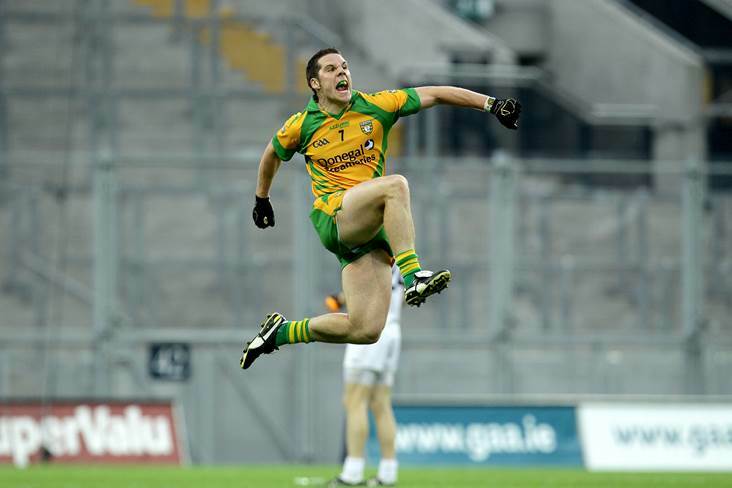 Donegal's Kevin Cassidy celebrates scoring the winning point in extra-time against Kildare in the 2011 All-Ireland SFC quarter-final at Croke Park. Donegal legend Kevin Cassidy has found a new lease of life in an attacking role, as he looks forward to his first county final appearance in 12 years. Respected nationwide for his outstanding defensive qualities during his inter-county career, Cassidy is now capturing the headlines further up the field for his club Gweedore. And In last weekend’s Donegal semi-final, Cassidy underlined his scoring qualities by finding the back of the net in Gweedore’s emphatic 3-14 to 1-7 win over Sean MacCumhaills. “My legs are not what they used to be and so it suits me that I don’t have to cover as much ground on the pitch as I used to when I was playing with Donegal,” explained Cassidy, who lined out with the North-West outfit from 2002 to 2011, winning two All Stars in the wing-back position in his maiden year and in his last. “I’m now largely playing in the full-forward line for the club and I’m really enjoying my football playing that much closer to the opposing team’s goal. “On our team, we have a great crop of young lads and so they’re well able to do a lot of the running further out the field. “In the semi-final I scored one of our two first half goals, and then we got a third goal early in the second half which really killed off the game for us,” added Cassidy, whose side face Glenties’s Naomh Conaill in rhe Donegal decider on Sunday week. With Gweedore having been absent from the county final stage since their 2006 win over Letterkenny’s St Eunan’s, Cassidy says his club’s advancement to the concluding stage of the competition is an achievement that is long overdue. “Gweedore is a parish that eats, lives and breathes football so there would have been a huge amount of disappointment that we would have been out of the final for such a long period,” said Cassidy, who was controversially axed from the Donegal panel by team boss Jim McGuinness in 2011 over a comment attributed to him in a book. “So there would have been a lot of satisfaction in the parish that we finally got over the semi-final hurdle. “But now that we are in the final, we desperately don’t want to finish second best on the day,” added Cassidy, who was born in Glasgow and lived in the Scottish city until he was eight years of age. For the county final, Cassidy will be joined on the Gweedore side by current Donegal aces Neil McGee and Odhran MacNiallais, and Neil’s brother, former county star Eamon. “Altogether, we have five players who featured for us back in the 2006 county final – myself, the two McGees, Chris McFadden and Danny McBride – so we have no shortage of experience in our side,” he pointed out. “And, as well, it’s a great boost that younger lads like Cian Mulligan, Niall Friel and Michael Carroll have been doing so well for us, so overall we have a fantastic mix of players. And indeed Cassidy is expecting the Glenties outfit to provide a stiff challenge to his side’s bid to nail down a place in the Ulster Club Championship. “Glenties have been in three of the last four county finals, so they certainly won’t be overawed by the importance of the occasion,” he stressed. “In the semi-final, they beat Michael Murphy’s Glenswilly by three points and that performance will give them a lot of confidence and encouragement. “Like ourselves, they have a number of current county players such as Anthony Thompson, Ciaran Thompson and Leo McLoone, and they are backed up by a number of lads who have played for the county at various levels.